Camellia is a genus of flowering plants in the family Theaceae. They are found in eastern and southern Asia, from the Himalayas east to Japan and Indonesia. There are 100–250 described species, with some controversy over the exact number. The genus was named by Linnaeus after the Jesuit botanist Georg Joseph Kamel, who worked in the Philippines, though he never described a camellia. 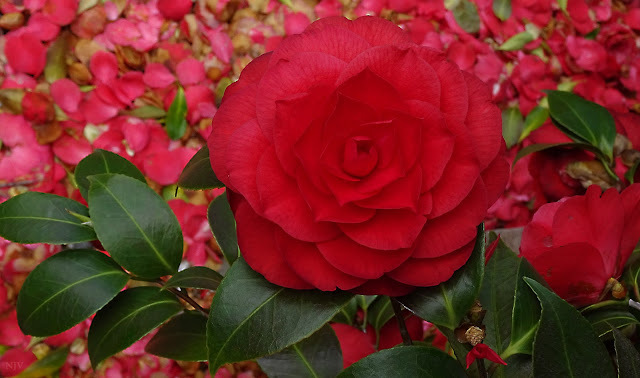 This genus is famous throughout East Asia; camellias are known as cháhuā (茶花) in Chinese, "tea flower", an apt designation, as tsubaki (椿) in Japanese, as dongbaek-kkot (동백꽃) in Korean and as hoa trà or hoa chè in Vietnamese. Of economic importance in the Indian subcontinent and Asia, leaves of C. sinensis are processed to create the popular beverage, tea. The ornamental Camellia japonica, Camellia oleifera and Camellia sasanqua and their hybrids are represented in cultivation by a large number of cultivars.